Gluten is a protein that is predominantly found in wheat, rye, and barley. Often found as a filler in processed foods. Can you be sensitive to gluten even if you do not have celiac disease? Should you stop eating gluten altogether? If symptoms occur, go off gluten again for another week or until symptoms improve then reintroduce gluten again to see if you get the same result. Get help with your gut health. Sal Di Stefano: What’s up everybody? I’m here with a special guest, a good friend of mine, a gut health expert and author of this awesome book, Healthy Gut, Healthy You, Dr. Michael Ruscio. Now, we have had him on the show, on our podcasts and we have talked lots of things about gut health. And on this video we discuss what are some of the things I should ask him. Something that keeps coming up all the time on forums related to gut health, with diets, people are always saying, “Should I go gluten free?” So let’s talk about gluten for a second. What is it? And is it the evil thing that everybody says it is? Dr. Michael Ruscio, DC: Well, to put it succinctly, gluten is essentially a protein. And there are other gluten-like proteins like gliadin. 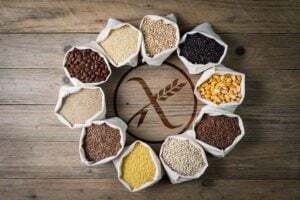 But in many grains, wheat, rye and barley most namely, you have gluten or other similar compounds that can cause inflammation, and in some people an autoimmune response. Now, the most clinical manifestation of that would be celiac disease, which I am sure we have all heard about celiac. But there is a growing concern about people who are not celiac, but may have a problem with gluten. And these people are becoming termed under a condition known as non-celiac gluten sensitivity. And this is where some of what you mentioned about some people say that gluten is a universal poison, if you will. DrMR: This is where this argument emanates from. And it is true that gluten can be a problem for people who do not have celiac. We have at least 5 clinical trials, 4 of which clearly illustrate this point. However, my fear is that there has been an overexaggeration in terms of how many people need to go gluten free. Or if we are even more careful on how we describe this, how many people have to be 100% gluten free, like your celiac, compared to people who should or would benefit from just reducing the amount of gluten that they ingest? Because there is a key differentiation there, which is to generally avoid gluten–it is not that hard–but if you 100% avoid it, it is fairly difficult. And we can get into the details that can help people navigate that. But for many people, a gluten reduction would probably be a good place to start, and they may not have to go fully gluten free. SD: Right, because celiac is almost like a food allergy, where cross contamination can cause a reaction. Like if I had food that was cooked on a surface that had gluten on it, that could be a problem. But for people with a mild intolerance or issue with gluten, then that would not be an issue. They would just need to generally reduce their overall gluten intake. Now, gluten is found primarily in what foods? DrMR: Wheat, rye and barley predominantly. But you can have cross contamination in oatmeal. And if you are very sensitive, there is a chance you could have it in almost any processed food, because it can often times be added as a filler. SD: Okay. And what are the common symptoms of a gluten intolerance? DrMR: Well, that is where this can get challenging, because the gut can manifest such a wide array of symptoms. We do know, for example, with celiac disease you may have solely a neurological response, meaning you have brain fog or what is known as ataxia, where you feel uncoordinated or like you have slurred speech. And you have no digestive symptoms. Now some people will have only digestive symptoms. Some people will have both. And there is some research being published now showing that people may have joint pain as their sole manifestation, or even skin breakouts, a condition known as atopic dermatitis. So, there are a number of symptoms that one could attribute to gluten. This is the way I would navigate this. Rather than saying, “Here are my symptoms; are any of these the key gluten symptoms?” I would look at it from a timing perspective. Do a short gluten free diet. I think 3 weeks is ample time. If you want to do it longer, you can. But avoid gluten strictly as your first line experiment, for at least 3 weeks, and then reintroduce the gluten. And if you notice any symptoms pop up, then there is a good chance that that symptom is being caused by the gluten. Now, if you want to be really scientific, what you could do is after that symptom pops up, go gluten free for another, let’s say a week, until that symptom has completely abated. Run the test one more time and see if it is consistent. And if you run the test more than once and you are noticing a consistent relationship, then you have qualified that reaction is most likely being driven by the gluten. And there is one other point there that is of importance, which is sometimes people are mistakenly led to believe that you may not notice the symptoms for a week, so a long period of time. SD: Yeah, I was going to ask you that. Because I was going to say, if you eat a gluten and you have an intolerance to it, how soon do you notice the effects? DrMR: Well the best answer we have to this question to date, at least to my knowledge, but it is fairly extensive in this body of literature, comes from an Italian study, a multi-center Italian study that looked up over 12,000 patients and found that over 90% who reacted to gluten had a reaction within 24 hours. So I think it is safe to say that if you notice any symptom pop up within 24 hours of a gluten ingestion, then you have a problem with gluten and that symptom will pop up within 24 hours. SD: Now any speculation as to why it seems like gluten intolerance is becoming more and more of a thing? I heard nothing about gluten 10 or 15 years ago at all. And I have been in the fitness industry for over 20 years. Nobody ever said anything about gluten. I don’t think I even knew what it was. And then maybe about 8 years ago, I started hearing a little bit about it. And now, there are entire sections in grocery stores that are all gluten free. SD: It has changed very, very quickly. Any speculation as to why? Or is it just hysteria that tends to happen with it? DrMR: I do think there is a degree of hysteria there. And if you want, in a moment, we can come back to some of the numbers in terms of what the science says. And if we juxtapose that next to the hysteria that you are describing, we will see what the science says and what people may think are somewhat different. But I think there has been a growing identification of celiac, but also more importantly, this non-celiac gluten sensitivity, meaning people who notice they have problems with gluten, but they have gone to a gastroenterologist and they don’t have celiac. And it is this that is becoming more well recognized, that it is leading to this broader adoption of the gluten free diet, which is definitely helpful. Please don’t get me wrong. But we also want to have the right balance of being progressive, but also being accurate in our understanding, just so that we prevent someone from going to the labors of being fully gluten-free, if they don’t actually have to be. SD: Right. And I think a part of the reason why people, not all, but a part of the reason why people feel so good when they go gluten free is they just make better food choices. Like rather than the fact that they are avoiding gluten, it is like, “I am not eating a lot of bread and pasta anymore.” Of course, you are probably going to feel better. SD: That is because you are making better food choices. So I think that might have something to do with it. DrMR: Absolutely. And so there is one challenge here. And this is why looking at clinical research studies is so important. If you take someone who is not eating according to any dietary plan and you have them improve their diet: (A) They are going to be placebo-affected into thinking that they are going to improve. And then (b), if they are drinking soda and eating processed food and added sugar and they go to a non-processed food diet, irrespective of what the diet is, they are going to benefit. And this is why we see people improving even when they go on a vegetarian diet, which for a lot of people may be fairly high in gluten. Relative to a standard American diet, we see studies showing that vegetarian can work, low fat can work, low carb can work, paleo can work, Mediterranean can work. There is documentation of all of these working. And to your point, when you come off of processed foods, you will feel a lot better. And now for some people, they are eating a lot of processed foods and processed grains like breads and cereals and crackers and pasta. And so, if they go gluten free, they are cutting out a lot of those foods as they cut out gluten. And they are eating more whole fresh foods. And so you get this kind of double benefit. Some of that is from the gluten. Some of that is from the other food. And some of that may also be from placebo. SD: Yeah. And I was just going to say, you can’t rule out placebo, because, I mean, when studies are done, they have to account for the placebo effect. And I can only imagine if someone is eating something and they believe that they are super intolerant to gluten and they are afraid of it, and then they go eat something, they may have more of a reaction purely from the emotional component. You are a gut health expert. You work with people all the time on this. How big of a role is state of mind, your emotions, things like anxiety and stress and fear? How big of a role do those play in your gut health? DrMR: In my experience, a very significant percentage. Now, we know—a little unrelated, but important to wrap into this—that in randomized controlled trials, where scientists are trying to minimize the placebo effect, the average placebo effect is 45%. SD: I didn’t know that. DrMR: So it is significant. And I think IBS is especially prone, because IBS isn’t something like diabetes. With diabetes, you test your blood and there is an objective measure. So much of IBS or these IBS-like symptoms, gas, bloating and then you could even include similar to that things like fatigue or brain fog, they are very subjective. So they are even more amenable to the effect of the placebo influence. But that being said, this is why I make such a careful remark regarding having an accurate understanding. Because I have seen more patients than I would like to admit who have come in indoctrinated to be afraid of food. And it is really poisoning their life, because they are afraid to go out. They are afraid to go to a work function. They are afraid to go to happy hour. They are afraid to go the Christmas party because there is going to be gluten or there is going to be this or there is going to be that. And so will we make gluten a staple in their diet? No. But would we allow them the leeway to have some on occasion, so as not to suffer this great encumbrance from this dietary restriction? Yeah, I think that is a pretty reasonable way to come at this. So, yes, your outlook has an important and measurable, according to some studies, impact on your health. And this is why I am so passionate about giving people accurate advice regarding gluten. Because if that causes you to be in this constant state of social or mental anguish, that will have a negative effect. SD: Yeah, that’s right. That alone will mess up your gut. Excellent! I appreciate you coming on the show. Thank you very much. Very interesting article. I did not know there was a term for people that are gluten sensitive. I have struggled with digestion problems all my life and was tested for Celiac and it came back negative. I later learned by accident at the age of 47 that I am gluten sensitive. I went on a gluten free diet as a support role for my son, who was put on a gluten free diet due to a chronic medical condition. It only took me one week to feel the difference. It was life changing! I have not had any digestion problems since then and I have been gluten free for 3 years. I am very surprised that you have not mentioned any blood tests. The first step in diagnosis is the 4 blood tests, namely, AeA-IgA, TTg-IgA, TtG-IgG and total serum IgA. For neurological symptoms, Tg6 antibody test is now found to be a good indicator. Are you referring to diagnosis of celiac?